As NIH Director Francis Collins recently noted on his blog, this year marks the 100th anniversary of the first experiment demonstrating that X-rays are diffracted by crystals. Two years later, this discovery was recognized with a Nobel Prize in physics. For this and other reasons, the United Nations has designated 2014 as the International Year of Crystallography . The designation offers an opportunity for organizations worldwide to increase public awareness of the field and promote access to crystallographic knowledge and activities. 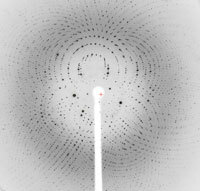 X-ray crystallography is central to many areas of basic biomedical research, and NIGMS supports a number of major crystallographic efforts that may be of interest and use to you. Since 2000, our Protein Structure Initiative (PSI) has undertaken the high-throughput determination of protein structures by crystallography and NMR methods, resulting in the deposition in the public Protein Data Bank of more than 5,000 macromolecular structures. The initiative’s current phase focuses on the determination of biologically relevant and important structures. Members of the scientific community can nominate proteins for structure determination, order protein plasmids and empty vectors , and access PSI data and other resources . Active PSI funding opportunities solicit applications for Technology Development for High-Throughput Structural Biology Research (R01) and Technology Development for Protein Modeling (R01). We also have been involved in supporting the construction, upgrade and maintenance of synchrotron beamline stations for X-ray crystallographic studies. These activities include a state-of-the-art facility at the Advanced Photon Source at Argonne National Laboratory, which we established in partnership with the National Cancer Institute. Our support of synchrotron facilities and of crystallographic technology development has improved access for NIH grantees and other users and increased the capacity for crystallographic data collection. In addition, we now oversee the Biomedical Technology Research Centers, several of which focus on developing and applying innovative crystallography techniques. These resource centers provide broad access to instruments, methods, software, expertise and hands-on training. I look forward to sharing more details about the International Year of Crystallography as activities get under way. 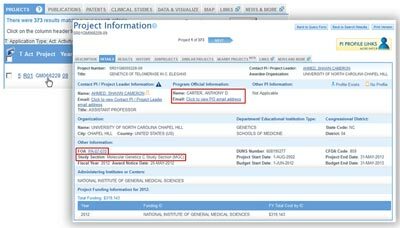 NIH offers two tools that can help you search for projects similar to the one you’re thinking about. 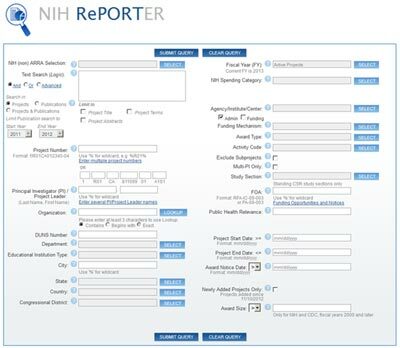 In this post, I’ll take you on a quick tour of the NIH RePORTER tool, a repository of information about NIH-funded research projects, and show you how to find information that may be useful to know before you start writing a grant application. A future Feedback Loop post will cover the thesaurus-based search tool called Like This. 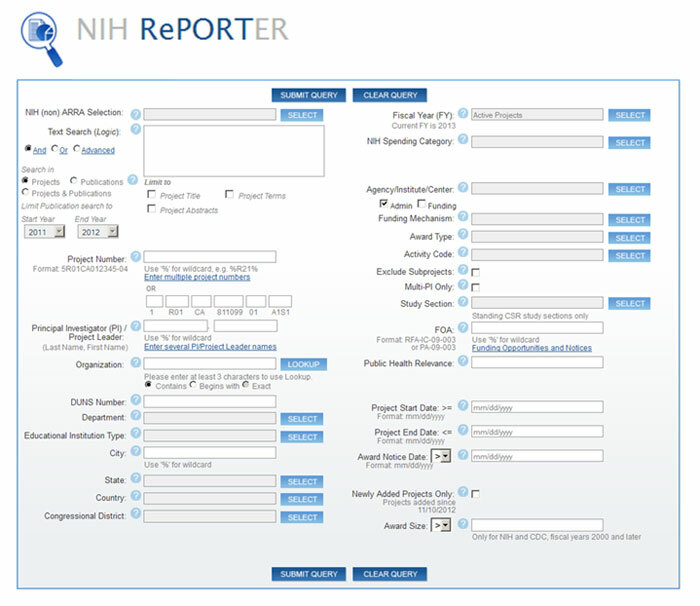 From RePORTER’s Main Query Form, you can search by principal investigator name, project number, organization, text term(s) and many other criteria. If you want to know which NIH institutes or centers fund projects like yours, or which study section would be most appropriate to review your application, then searching by text term(s) would probably be the best approach. To find projects in a particular research area, you may start with the “Advanced” text query option, which allows for complex queries using the Boolean operators “and,” “or,” and “not” along with parentheses for nesting phrases. 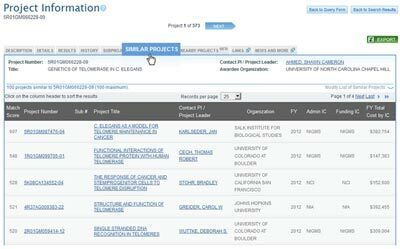 The example below searches for projects on telomeres and their relationship to cancer using wildcards (%) and synonyms to encompass variations such as telomere, telomerase, neoplasm, neoplastic, etc. TIP: One way to limit the number of search results is to use the Funding Mechanism field on the Main Query Form to select the mechanism(s) most relevant to your particular search (e.g., “Research Project Grants” or “Training, Individual”). If you already have a funding mechanism in mind, you can type R01, R21, F33, etc., into that part of the Project Number field. 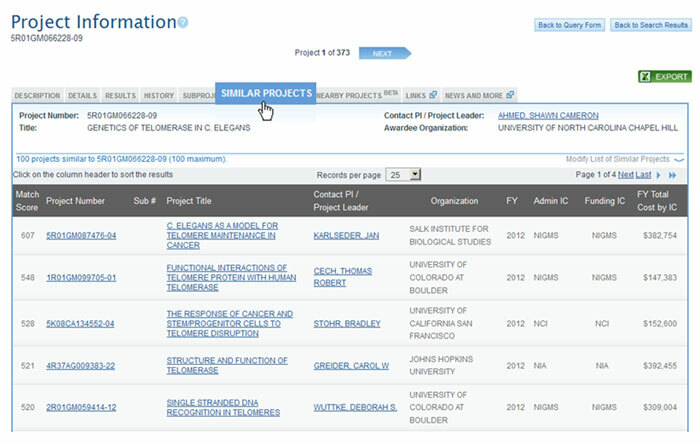 Once you have entered your search and submitted the query, you’ll get a Project Search Results page, which displays the grant number, project title, principal investigator’s name and organization, NIH funding institute or center, and fiscal year total cost. To get specific information about a particular project listed on the Project Search Results page, click on its Project number (e.g., GM066228). You’ll get the Project Information Details page that lists the grant’s program official with contact information, the study section that reviewed the application, and the funding opportunity announcement (FOA) to which the application responded. By viewing the details of projects most relevant to yours, you can begin to get a sense of which program director(s) to contact to discuss your potential application, which study sections review applications like yours, and whether applications in this area typically respond to a parent FOA or a special initiative. From the Project Information Details page, you can use the tabs near the top to get to pages with other information relevant to your search. For example, the Description tab takes you to the grant abstract. Reading these can help you become familiar with other funded projects in your interest area and help you identify and highlight what’s unique about your proposal. The Similar Projects and Nearby Projects tabs offer additional ways to find grants related to your search term and to find potential collaborators. TIP: To refine your original search term on the Main Query Form, use the results from the Similar Projects tab to identify alternative phrases in project titles and abstracts that can increase the effectiveness of your text search. 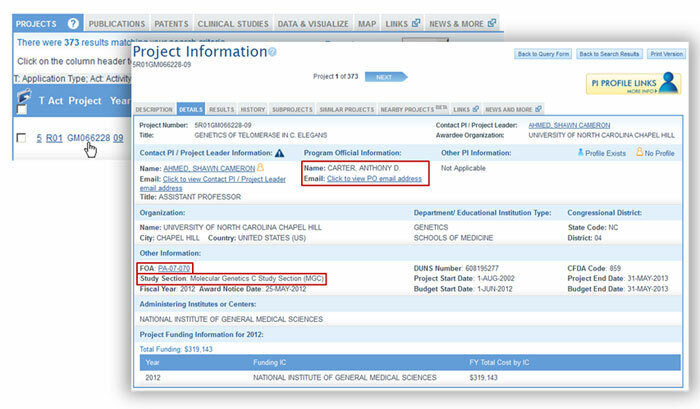 Another feature, available from the Project Search Results page, is a tab called Data & Visualize. This provides a graph of the NIH institutes or centers that administer research in that area and their levels of support. 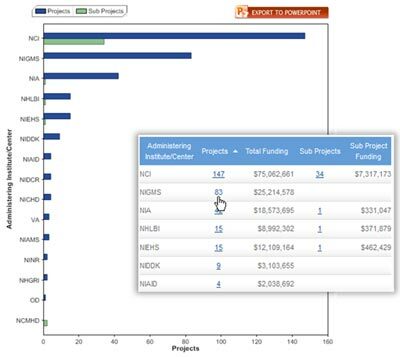 The table next to the bar chart lets you drill down to see projects by funding component. I hope this sampling has introduced you to some useful ways of exploring the NIH-funded research portfolio. We continue to make RePORTER faster, easier to use, and more informative, and we welcome your comments and suggestions, including topics for other RePORTER tutorials. Send them to RePORT@mail.nih.gov or directly to me at onkenj@od.nih.gov. Communication and transparency are core values of NIGMS, and the Feedback Loop is one way we put those values into practice. On the occasion of our 300th blog post, we take a moment to look back, look ahead, and look for your continued input. Our former director, Jeremy Berg, started the Feedback Loop in 2005 as an e-newsletter distributed three times a year. In 2009, we switched it to a blog format to share information in a timelier way and provide a better platform for discussion. Since then, more than 50 NIGMS staff members have contributed posts announcing funding opportunities, meetings and job openings; offering application guidance and tips; sharing funding trend data and other analyses; and more. Whether posted on the blog or addressed to me or other staff, your comments and questions have helped us provide or clarify information about the funding process and other topics important to you. Since we created this blog, a number of other NIH components have started blogs of their own. Sally Rockey of the NIH Office of Extramural Research has been blogging for nearly 2 years on Rock Talk about grant policies, funding trends and other issues of interest to the extramural research community. And earlier this month, Francis Collins launched the NIH Director’s Blog to highlight recent discoveries in biology and medicine. We look forward to new opportunities for synergy with these and other blogs. Above all, we hope you find the Feedback Loop a useful resource. As always, we welcome your comments, input and feedback on topics for future posts or other ways the blog can best meet your needs. Collaborations are an ideal way to enhance a research project by introducing new approaches and complementary expertise. To support collaborative efforts by NIGMS grantees, we’re continuing our Supplements for Collaborative Science (SCS) program with two submission deadlines in 2013: January 15 and May 15. Investigators can request supplements of up to $90,000 per year in direct costs for two collaborating labs or up to $135,000 per year for three collaborating labs. 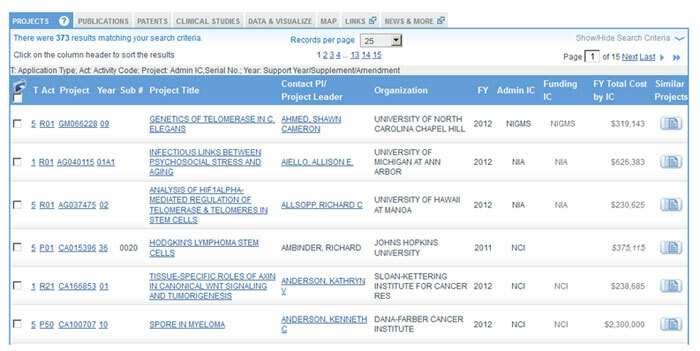 To be eligible, an NIGMS parent R01 or R37 award must be actively funded through July 31, 2014, for the January deadline and through November 30, 2014, for the May deadline. Proposals may request support to cover a period up to the end of the parent project. The proposed research must be within the original scope of the project and should propose approaches not used previously by the principal investigator. All collaborators should be able to make significant intellectual contributions, and we especially encourage proposals that involve less commonly combined areas of expertise. One new aspect of the submission process is the requirement that the collaborating investigators provide a letter of commitment and “other support” page countersigned by their institutional official. For more details, see the funding opportunity announcement. Send any additional questions to me at andersonve@nigms.nih.gov or to Sue Haynes at hayness@nigms.nih.gov. The SCS program is very competitive, so if you are interested in submitting an application, we recommend that you first discuss your potential proposal—and its new and novel aspects—with your program director. Since 2008, NIH has required as a condition of all grant awards and cooperative agreements that scientists make their findings publicly accessible through the widely used PubMed Central repository. To increase the number of papers available to the public, NIH has announced that it will delay the processing of noncompeting renewals whose publications are not in compliance with this public access policy. The change will take effect as early as spring 2013, and it will coincide with the required use of the Research Performance Progress Report (RPPR) for SNAP and fellowship awards. For more discussion on this topic, including how to ensure you meet the policy requirements, read Improving Public Access to Research Results written by NIH’s Sally Rockey. All JIT information must be submitted via the NIH Commons. The JIT function button will be activated for all scored applications, just in case it’s needed. This is neither an indication that you should submit JIT information nor an indication of your application’s likelihood of funding. If your application has an impact score between 1 and 40, you will receive an automated e-mail, which only tells you to follow the JIT guidelines of the application’s corresponding NIH IC. Receiving this message does not necessarily indicate that you will need to submit JIT information, as noted in the NIGMS guidelines below. If your application, with the exception of T32 or R25 applications, received a percentile ranking between 1 and 20, or if a percentile ranking is not specified and the priority score is between 10 and 30, please submit Other Support information within 2 weeks of the availability of the Summary Statement. In addition, if your research involves vertebrate animals or human subjects, you must submit information as described in the above referenced Actions on Applications after Initial Review sheet for instructions on completing this information. Should there be changes to this guidance, they will be reflected on the Web page, so I encourage you to check it each time you receive a summary statement. We’ve also posted JIT details for Training, Workforce Development, and Diversity grants, fellowships and SCORE grants. If your application’s grant mechanism isn’t covered, please consult the program contact listed on your summary statement for instructions. In the future, we plan to cover what goes in the “Other Support” document and why we ask for it. Last Friday, we hosted Cell Day–an extremely exciting online interactive chat about the cell. During the event, many members of our scientific staff, including our Acting Director, Judith Greenberg, fielded more than 140 questions from mostly 5th through 12th grade students and teachers across the country. Which living organism has the most cells? Why have plants not evolved to be black in color in order to maximize light absorption? What inspired you to take an interest in biology and its beautiful diversity? Read the transcript to view more questions and our answers. While Cell Day was developed as an NIGMS 50th anniversary activity, we enjoyed it so much that we plan to do it again next year as part of our continued commitment to science education.